The stone that Tony Leonard was holding had taken him a couple of days to carve. It’s called a ‘springer’ because from it spring the intricate lines that make up the tracery of a gothic window. The next time I pass St Botolph’s church in Boston, it will be in place, white and crisp looking, compared to those around it. In a few year’s time, it will have weathered and softened: only an expert eye will be able to distinguish the new stone from the old. Tony and his brother Phil have been stonemasons at the Boston Stump for 34 years. A job they began in 1980 – a few months after Margaret Thatcher became Prime Minister – has gone on and on, as funds have been raised and new repairs identified. They can see their work throughout the building, from the tower downwards: the south window on which they are working today is just the latest in a very long line of projects. Next year, Tony and Phil will make the long journey from Nottingham, where they live, to Boston for the last time. 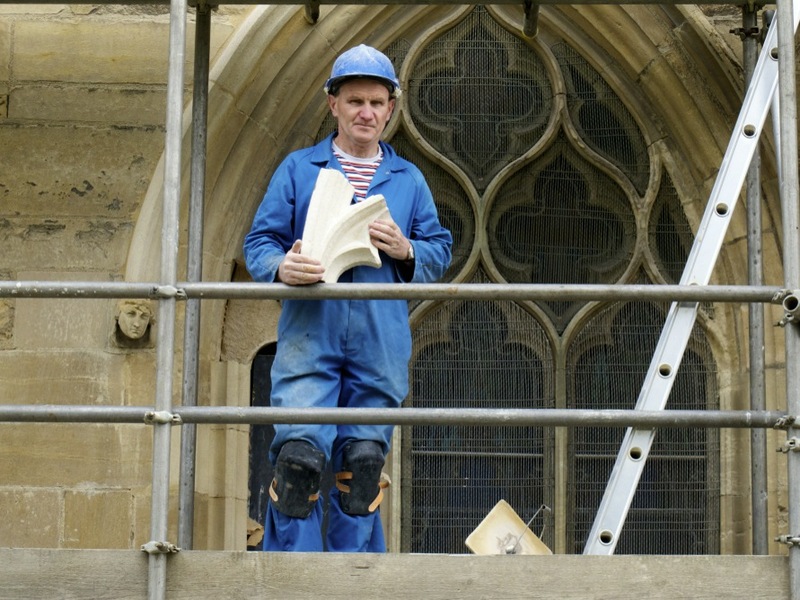 They will retire and the church administrators will have to find a new way to manage the everyday conservation of the building. It will not be easy. In some ways Phil and Tony Leonard must know this church better than anyone alive, through the daily task of handling it. Their knowledge is experiential, not intellectual, held in muscles and fingertips. It can’t be written down for someone else to read: it can only got by doing. That’s why stonemasons have traditionally learned their craft through apprenticeship, learning from those who have travelled the same paths before them. The same could be said for all those who have laboured by hand and mind and heart to build and maintain their churches for each succeeding generation. Workmen removing the bells from St Botolp’s during the 1932 restoration of the tower.